"Four on the Floor, Break Stuff." In space, a crew of astronauts find the gravity on Earth has disappeared. They are then cut off from Earth. Superman, high in the air, descends away from the Mxyzptlk twins, attempting to save people from flying into the atmosphere. He calls the JLA and gets The Flash on monitoring the global catastrophe. Buildings start rising into the air. Superman calls Atom and tells him to meet him in the Fortress of Solitude. The Mxy twins start playing word association with the chaos rising about them. On the west coast, reality is uncoiling. In Russia, Red Square falls apart. Themyscara is in disorder. Two green streaks rise above the Earth. Superman and Atom, in the Fortress, ponder the White Dwarf that Atom has brought, and its scientific relation to gravity. The Mxy twins talk about the relationship Mxy has always had with Superman, because the male doesn't seem to know. They decide that they no longer want to be a mere annoyance to Superman. They then decide to revise history, and magically make themselves the person who made Cole Parker Persuader. Tempest and Green Arrow try to save people in their respective home towns. For some reason, they are able to stay on the ground and in the ocean, respectively. Superman holds the White Dwarf in his hands, and Atom explains how he can. The Green Lanterns and Sentinel Encase the Earth in a green amber which is breathable but holds everything in place. Superman descends into the core of Earth, super-heats the White Dwarf, and gravity is restored. In space, the astronauts monitor the progress of the Man of Steel. Gravitic pressure pounds Superman, but he manages to escape the core alive. Superman takes the astronauts back down to Earth just as their air is about to give out. Superman goes to the Mxy twins and agrees to buy their encyclopedias. He tells them to bill him. The Mxy twins inform him that they are no longer content with being annoyances, and next time, they will become REAL supervillains. They return the world to normal and disappear. Perry awakens in a hospital wondering what happened. Lois and Clark ponder what Mxyzptlk will do next. They are glad Perry is back to normal. Around them are hundreds of Encyclopedias. Story - 1: There are slight sounds of screaming, then the reviewer rises, bangs his fist on his computer desk, runs outside, hits a tree, turns green and starts to leap miles, returns home, shrinks back to normal, and approaches the keyboard with what he sincerely hopes to be fair, impartial journalistic integrity, a la Superman, because hands down, this is the third straight time he's had to 1 of 5 Joe Casey and wonder why he is writing Superman, and not said reviewer. "There's something specific that audiences want from the Superman titles that we are not delivering, and it seriously bugs me. Ironically, it seems that the books went on a decline when they were separated, so so much for giving readers what they want... beyond that there's some other surprises that will hopefully put the Man of Steel back where he belongs. I certainly don't want to end my career as the man who tarnished the Man of Steel. And to think two years ago everyone was happy with how everything was going. If you guys have some more insight, please share." Well, Eddie, I will now share. I love the fact that you answer questions for this site. It means the world to me, and a number of others, but I'm sorry, this issue makes me have to tell you EXACTLY what you need to know. I speak truth. I've read Superman my entire life, and every issue for the last ten years and then some. First, to gain your audience back, though it is indeed a comic book, and a somewhat physics-bending, disbelief-suspending one at that, certain implausibility must be avoided. Ones that are, just, how to say it, blatantly ridiculous. For instance, if you take away all gravity in the world, everything, dirt, even the core itself, starts flying into the air. Secondly, if you remove Earth's gravity, it means you remove the Sun's gravity, because the sun CAUSES the Earth's gravity. Thus the sun flies apart, and no one survives. Perhaps the Universe unravels. If Earth's gravity disappears, the moon flies off into space, probably on a slingshot, and Atom, most assuredly, can not stay on his feet, even with artificial gravity, because said artificial gravity would rely on a system that pulls from the moon, which, without Earth's gravity, has little to negligible ability to hold a person down. I think. Either way, there's something fishy and beyond suspending belief there. Also, there's the little fact that the Super-physics, largely as defined for the last sixty years, indicates that Superman would be utterly powerless with regards to flight if gravity were removed. Why? Because his power of flight is based in the fact that his DENSITY, a function of mass and weight, is so much greater than that of Earthlings, and why is this? It's based in, yes folks, Earth's GRAVITY. So, basically, Superman is so light on Earth because of his strength that he can control gravity and fly. So if you remove gravity, what does he control? Nothing. He can fly in space, but one assumes that he does so because he uses the gravity of the sun, perhaps, or the gravitic pull of other heavenly bodies. Assuming that Earth's gravity is based in these laws, it is still doubtful that he would even be able to fly in space if you remove Earth's gravity. He would be stuck right where he was when they removed gravity, or, likely, 1) If the sun still has gravity, be able to slowly move towards the sun (suuuuuuuuper slowly) and gain more powers of flight, or, more likely, 2) be stuck in place, because the sun has no gravity any more. Either way, he would not do what he did, which is go and restore gravity. Which brings me to the other major implausibility of this comic. The fact that Superman, a man who has confronted Mxyzptlk, what, oh, EIGHT HUNDRED MILLIONS TIMES, would go around trying to fix the problems that Mxy creates, when he knows GOOD and WELL that all he has to do is somehow convince him (them now?) to stop what they are doing somehow and everything goes back to rights. Of course, maybe not, after this issue, but oh, lord, we will get to that in a moment. But hey, for the sake of argument, let's assume he would do that. How would Superman, even SUPERMAN, hold a white dwarf star. Talk your Star Trek prattle all you want, Atom, it isn't happening. I have a very rudimentary knowledge of physics. I got Cs. Low Cs. But I know some things, some basic things, and one of them is that Superman cannot pick up a White Dwarf. Why? It's about a BAJILLION times as dense as a Red sun, right? And Superman's powers are based in his density, right? Save heat, cold, and X-Ray vision, acourse, but those are related. So it would be like you or I lifting a very small version of the Kryptonian sun. Ain't happening. But oh, let's look beyond that. Let's ignore the hypothetical bad and look at the patently obvious. Green Arrow, Tempest, and other superheroes, for some reason, just magically can stay plugged to the ground when gravity is gone. As do some buildings, because they're what, ATTACHED TO THE GROUND? Well, what's holding the ground down? Magic? No. Magic is lifting the ground UP. Oh, hey, that's okay though, folks. Let's just look at the continuity ramifications. Cole Parker is the Persuader. I, the writer, can't think of an interesting way to have brought a second version of an established, well-loved character into my private comic book world (Persuader), so I'll use a second version of an established, well-loved character in my private comic book world just magically, for no apparent reason, have created that character. Just because. And both characters, by the way, will be completely lame rip-offs of the original character, as well as being out of character, particularly in the Mxy case. But oh, lord, we will get to that in a moment. Perry remembers that he saw Mxy, even though everything is brought back to how it was before. As does Superman. Strange. Also strange is that the male Mxy twin had no idea about how Superman and Mxy related, as is proven by his ignorant dialogue in the two page word association comedy bit that failed miserably. There is no gravity, but a space station stays together and near Earth instead of rocketing into the void. And SAID spaceship factors into this issue for absolutely NO reason whatsoever. I won't go into the question about whether Superman, even Superman, could survive the core of Planet Earth, but he's done the sun (which I also disagree with, by the way, though it makes SOME sense), so we won't harp. But let's get right down to the heart of this matter. Mxyzptlk is an institution of the Superman character, and a beloved creation of the American Pop Culture. He is a cute-sy, annoying, cigar smoking imp from the fifth dimension who doesn't really mean any harm but loves to cause chaos. Say his name backwards, he disappears. Not exactly a Darkseid, but something fun and lighthearted, when you want to go that way with Superman. Like Bizarro. A great, time-tested character. Some hate him, some love him, but he's ultimately defined, much like Toyman and Metallo. Now Mxyzptlk is a recreated set of twins with an urge to become murdering supervillains, a philosophical musing bent, and you can't send them back by saying their name backwards. They also hate Superman. Mxy never hated Superman before. He LOVED goofing with the big lug. There may be a good reason to change Mxy. Some character have profited from reexamination. Superman dying, Superman changing costume, having his hair long, people grumbled, but there was a reason. Superman had never died. His costume had never changed. His hair was always short. Now, Mxy has never been a cold blooded killer, but then again, neither has Superman! Let's do it! No. Because it doesn't make sense. Maybe if Mxy got upset that Superman was always annoyed with him when he came around, then took Lois for a while, and then returned her, unharmed, maybe a little shaken, then DIDN'T make it not happen, that would be a good test of Mxy's boundaries. But this change was ten times as abrupt as Winslow Schott murdering Adam Grant. And say, while I'm on that subject, anyone seen Jose Delgado, Cat Grant, Perry White's wife, son, etx, Bibbo, Ron Troupe, Ceritak, Dirk Armstrong, or the like lately? Whups. That's another issue. They just disappeared. Maybe Mxy did THAT. Maybe THAT would be a good new direction. My point being, this change was unnecessary, the change was like chewing glass, and the story was horrid. Just festering, fetid rotting horrid. 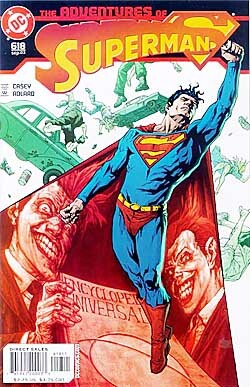 Let's make Mxy SCARY and have Superman act out of character and make things that happen which are implausible. Eddie, this is the problem. This is why sales are dropping. All of the things that the non-fairweather fans loved, those that are still around, like me, have been systematically destroyed in your run. There were six years where Superman may not have been as exciting as he seems to be on the surface now, but he was at least consistent, well written, and within the realm of possibility and continuity with original ideas. Dominus fizzled, sure, but at least it was one, continuous, consistent story. So he failed as a villain. He was at least interesting. Doomsday killing Superman, to his return, stands out as a great run because it melds concern for real damage to our icon with an original, exciting, and well written story. The Trial of Superman is classic because it shows Superman dealing with being a villain, something he'd never had to confront before and had to think his way out of. Imperiex was half-classic because it had a real, imperiling villain that reached across all the titles in a continuous story and struck at the heart of the Universe, and Superman led us through it. Right now, we are back to what caused the revamp of Superman in the eighties. There is no consistency, month to month, all of the stories are meant to be self-contained and no one knows which happens before the other (look. This issue Lois is still a reporter, last issue, she stormed out for no reason on the Planet to become, what, an ANCHOR? She's an award winning journalist! Newscasters are HANDED COPY! THINK before you change beloved things!). Things are hokey, villains are hokey, Superman is CLICH� and not human, Lois is absent or a witch with a different first letter, Jimmy's too busy out being cool to be Superman's Pal, Clark doesn't work at the Planet, Luthor's been President for THREE YEARS and you've gone NOWHERE with the potential there save Imperiex, pre-conceded a paragraph back. You say that separating the comics caused a decline in sales, though this is what the fans wanted. No. I think this is misunderstood. This is what fair-weather fans, like the ones who spiked sales during Imperiex, demanded when they saw that their favorite artist du jour (even I fell for the glory that was Loeb and Mac to a large extent) wanted to go directions the other artists didn't seem willing/capable of going with them. That's what minis are for, like Birthright (which is on its way) and Metropolis (mostly good, largely because it's out of mainline). Here's what you need to do. Take a group of people who have been reading Superman for decades, years, etc. People who KNOW what sells, what's fun, and what needs to be done to make Superman the icon he once was. Put them in a big room. Have them help you figure out what makes Superman great to longtime fans, the ones that put in their dollars, sink or shine, for the Man of Steel every week, because these are the bulk of your audience and EXACTLY who you lose when Superman descends as far as he has into mediocrity of late. You tell your writers to quell their directions and use their artistry to do what the fans want. The biggest flaw with your run that I've seen is that you give your writers too much free reign. As a writer, I am aware of two simple, perhaps unfair truths. I can write whatever the heck I want (and do) as artistically as I want, and it may be interesting, but it probably won't be what people want. This is Superman now. Or the second truth. I can conform to what the people want (which is not exactly the most artistic thing in the world, but it can certainly have a personal touch) and make a difference in the world of literature, publishing, comics, and what-have-you. I openly challenge you to do this. I volunteer to help you head the project. I even throw a further gauntlet down and here, publicly, state that I will give you 15 dollars a month for the rest of your life if I cannot raise sales at least ten percent with the group's input implemented. I can almost guarantee such a direction would bring heretofore unparalleled success to our favorite comic. Petty bribery? Perhaps. I'm showing you, however, that I'm willing to give you, as are many, the amount of money I spend on Superman comics EVERY MONTH, sink or shine, for a chance to have Superman as I and many others want him. I speak from consensus. I do not dally with my own petty wants for the Man of Steel. For instance, I want Superman to have a Super-Kid, and a dog, but logistically, it JUST DOESN'T WORK. Too many inconsistencies arise. Or, if you would like to use my services in some other capacity, I am willing to work on any Superman comic, in any way, free of charge. Even if sales spike a million-fold and make DC corporation the richest entity in the universe. I pooled the advice of a number of the people who read my reviews (and concurrently Superman comics) to find what was wrong with current continuity and amalgamate things back into an exciting, thought out format that lacks inconsistency. I teamed with a talented Venezuelan artist, and created a Superman comic book, as I (we) see they should be. You can find it on my homepage, http://bailey_neal.tripod.com/supermanunlimited.html. It takes place slightly out of current continuity, thanks to changes in the comics of late in the middle of writing and penciling, but the basic gist is what we want. Mainline villains and characters acting as they have in the past in original ways, if that's not too contradictory. I am an accomplished writer who doesn't know how to get into the business, but I write professionally (meaning for no money, har-har) and I hold a degree in English. My services are at your disposal. Bring back the old logos. Bring back what made Superman great in the 90s, but lose the same artists all the time. Rotate artists. Bring in kids who will do what they're told, and do it with originality, and have a committee of fans decide what that is. I openly challenge you to try this. Thanks. The only cool thing in a Superman issue shouldn't be Angelina Jolie with a milk moustache in an ad. Art - 1: Superman is not a brooding angry hero. He is the wellspring of idealistic hope in the DC Universe. He should be drawn as such. Here he looks mean, undefined, and lost in a dark, dark world of solid mean colors and cynicism. He's been lost in it for the last two years, and some of the last four. Cover Art - 1: No background, Mxyzptlk looking like the Devils themselves, Superman looking more like Jimmy Olsen in Metropolis than Superman, and look, in a comic book for kids, a woman with her skirt lifted up to expose her underwear to the viewer. Don't get me wrong, I loves me the women, but such things are better left to the interior of a more adult-oriented comic book. And look at the logo. SupermanS.